May 1st, 2009 by Alisha K.
It’s really difficult to fight hordes of zombies without some serious snacks. You’ve got to keep your energy up, after all, and most of us don’t find random bottles of energizing pills around… so instead, we eat cookies. 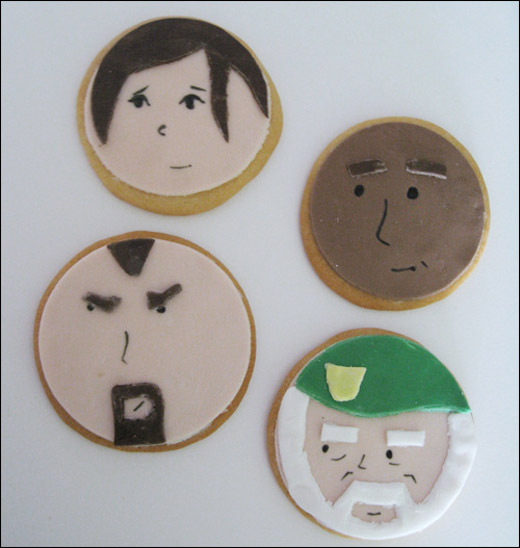 And at least one clever and talented individual out there is eating survivor cookies. 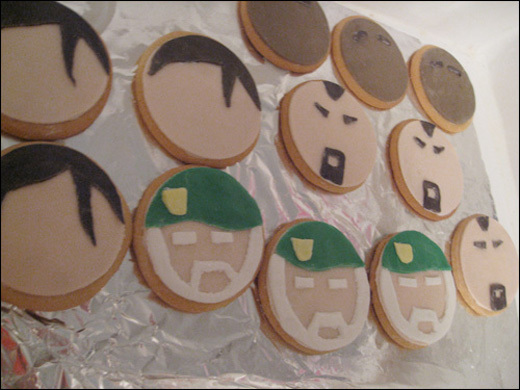 I honestly believe these may be the most amazing sugar cookies I’ve ever seen, but I may be biased on account of my raging adoration for all things Left 4 Dead. But check out those little faces! Not only are they pretty accurate, but they’re very well drawn as cookie decorations go. Jocelyn of Snack or Die reportedly used a food coloring pen to achieve those tiny facial features. All that’s missing are a few sugary speech bubbles attached to the Francis cookies, extolling all of the things he hates, like vans and Ayn Rand.